Currently filming for World War II drama "VIVE LA FRANCE"
German-occupied France, 1944. German soldiers storm a village believed to be harbouring French resistance fighters. Killing all of the adults, the soldiers take the children into the forest, to where an SS Commander awaits them. The Commander is going to put the children through an horrific test to prepare them for a life in the future Empire of Germania. Designed to totally demoralise and quash any resistance the children might have, the Commander does nothowever reckon on a child's love for his younger siblings and friends, and how one act of defiance, courage and sacrifice will unravel everything. who is in a constant power struggle with his superiour.Eventually Werner loses the battle. Jerome plays his character entirely in the German language and a few lines in French. 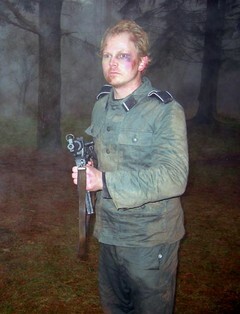 Jerome as the German soldier Werner.